Standing outside St Mary's - at 1,300 feet above sea level said to be the highest church in England and looking at the panoramic view, it is possible even today to imagine the original church or chapelry at Bettys-y-Crwyn. On this still lonely and windswept hill it was built perhaps seven hundred years ago, for there is a brief mention of it in the records of Wenlock Priory in 1276. The ancient drover road from Wales into England offers one reason for the choice of site, and it may have been a shrine for the well (perhaps with healing properties) that is now in Ladywell Cottage garden, just down the road. The drovers and hill shepherds must have been the first worshippers in this building. Of this early church little remains - possibly only the north and south walls of the nave. Dean Cranage in his work on the Churches of Shropshire (1901) says that as far as the architectural evidence goes "… it appears that the nave dates from the 14th century or the latter part of the 13th, that the roof and screen were erected some two hundred years later, and that the chancel and porch are modern." The rood screen is of great beauty and interest with elaborate and varied tracery, and the roof of the nave has notable carving. In an 1863 directory of Shropshire the roof timber is described as Spanish chestnut. The wooden pulpit and the altar rails are Jacobean, as is the cover to the modern font. An old font, probably discarded in the extensive restoration of 1860, was recently discovered in use as a drinking trough, and was brought back to the churchyard. On the wooden ends of the pews are painted the names of the farms to which they were allotted. When the chancel was rebuilt during the Victorian restoration the porch and a turret for one bell were added. 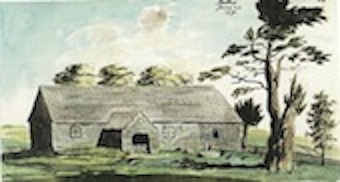 At this time the thatch was replaced by slates, but there are still two hooks outside on the north wall, which held a pole ready for fire in the days of the thatched roof. Lollards and one Edward Waterden, “Capellanum parochialem capelle de Bettus” was called as a witness. In 1479 David ap Meredyth de Bettus was in trouble for not paying his share of the subsidy voted by Convocation. The parish registers begin in 1662. Many of the pages are faded and damaged but enough remains for the reader to follow the chronicle of births, deaths and marriages. Charles Henry Bowman. Since 1962 the parish has been part of the Clun group. "Near this place is interred the remains of the Revd. JOHN JONES late curate of Llanverwaterdine and this Parrifs who died May 21st 1767 Aet 66. He was a loving husband and a tender father. A peaceable good neighbour always ready to visit the distressed; and his surviving friends will long lament his loss." This memorial and others inside the church and in the churchyard are a reminder of the generations who have lived and worshipped here. They cared for the fabric and appearance of the building just as the people of the twenty-first century care now. Through all the years the parishioners have respected and revered the traditions and the spirit of this little church.